Ezekiel 38:18-23 is God's unveiling of Himself to the world in a most dramatic fashion. Hopelessly outnumbered by the combined armies of Russia, Iran, Turkey, Sudan, Lybia and other Muslim nations and led by a demonically driven leader named Gog, Israel has no possible hope of surviving on their own. Then, God steps in. He smashes the armies with supernatural devastations of biblical proportions. The whole world then knows "that I am the LORD." What will be the fallout for Gog and what are God's purposes for such a public display of His power? Ezekiel 39:1-8 describes the tremendous aftermath. "1Son of man, prophesy against Gog and say: 'This is what the Sovereign LORD says: I am against you, O Gog, chief prince of Meshech and Tubal. 2I will turn you around and drag you along. I will bring you from the far north and send you against the mountains of Israel. 3Then I will strike your bow from your left hand and make your arrows drop from your right hand. 4On the mountains of Israel you will fall, you and all your troops and the nations with you. I will give you as food to all kinds of carrion birds and to the wild animals. 5You will fall in the open field, for I have spoken, declares the Sovereign LORD. 6I will send fire on Magog and on those who live in safety in the coastlands, and they will know that I am the LORD.'" Ezekiel 39 begins by adding more details to the Gog-Magog Battle and the armies' subsequent destruction. How will God drag Gog and his armies down to invade Israel? When God says "drag you along" we refer back to the hooks mentioned in Ezekiel 38:4. The ancient Assyrians used to like to humiliate the peoples they conquered. The Assyrians would put hooks into those they'd conquered's mouths or through the skin between their shoulder blades on their back. The "hooked" would then in humiliating defeat pull the Assyrian chariots all the way back to their homeland. 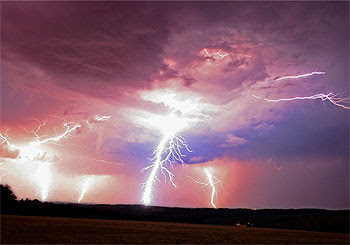 And so, God is saying here that He is going to humiliate the Gog-Magog coalition. If you've ever seen the Indiana Jones movie where he was being dragged behind a truck or a tank or a plane (Indiana Jones was always being dragged around behind something), it is just like that. God is dragging the armies down so He can decimate them. He drags them down to the "mountains of Israel," indicating where the battle field will be — on the mountains of Israel. In verse 6, God promises to "send fire on Magog and on those who live in safety in the coastlands." And so, not only does God decimate this international army when it reaches Israel, but He goes back and starts decimating by fire their home countries as well. God starts blowing up Russia and Iran and Turkey and all those nations involved. Joel 2:20 even alludes to the aftermath of God's victory in the Gog-Magog Battle, resulting in one sixth of the invaders being driven into Siberia, "a land barren and desolate with his face toward the east sea." One-sixth of the invaders is all that will survive Gog's foiled invasion. The Gog-Magog Battle is a very thorough and complete victory for God Almighty! "7'I will make known my holy name among my people Israel. I will no longer let my holy name be profaned, and the nations will know that I the LORD am the Holy One in Israel. 8It is coming! It will surely take place, declares the Sovereign LORD. This is the day I have spoken of." The world will know that God protects Israel. The end result of God defeating Israel's enemies is so that He will be glorified, honored and praised. What will it take to clean up after nearly three-quarter million to a billion people die by God's hand on the mountains of Israel? In the next part of this "Impending Invasion of Israel" series we'll study Ezekiel 39:9-20 to unearth the gory funeral purification rituals. 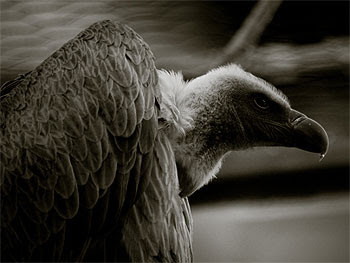 Vultures are magnificient flyers that can spot the dead from high up in the sky. They are very big birds, about 30 lbs, and huge wing spand, around 6 feet. They can glide on the air currents...like Eagles...CHRIST FOLLOWERS SHOULD BE EAGLES! or a dove! Of course look at the context in each story of the Bible. Vultures gulp down flesh with their sharp beaks very quickly. They don't sing like most birds...they "hiss, wheeze, and cackle"...and stick their long necks into bodies to devour the flesh and with in minutes nothing is left but bones. Not trying to gross anyone out...just those vulture images are put in the Book of books for a reason. Gross...is a lot like vulgar...a lot like vulture???? Just a few "dead bodies" to think about for starters...quite a minor them running through out the Story of stories! oops..."quite a minor theme running through out the Bible"
Prohet Mohammed said: "Every day, Gog and Magog are trying to dig a way out through the barrier. When they begin to see sunlight through it, the one who is in charge of them says, 'Go back; you can carry on digging tomorrow,' and when they come back, the barrier is stronger than it was before. This will continue until their time comes and Allah wishes to send them forth. They will dig until they begin to see sunlight, then the one who is in charge of them will say, 'Go back; you can carry on digging tomorrow, in shaa'Allah.' In this case he will make an exception by saying in shaa'Allah, thus relating the matter to the Will of Allah. They will return on the following day, and find the hole as they left it. They will carry on digging and come out against the people. They will drink all the water, and find the hole as they left it, and the people will entrench themselves in their fortresses. Gog and Magog will fire their arrows into the sky, and they will fall back to earth with something like blood on them. Gog and Magog will say, 'We have defeated the people of earth, and overcome the people of heaven.' Then Allah will send a kind of worm in the napes of their nacks, and they will be killed by it...'By Him a in Whose hand is the soul of Muhammad, the beasts of the earth will become fat.